Terminal 1 — ivy-yeh design. This is a freelancing project. Terminal 1 team found me on dribbble.com. Terminal 1 is an start-up from Hong Kong. It is a recruitment firm that hires software builders to both recruit and build automated recruitment tools. The recruiters are highly skilled software engineers, product designers, data scientists, accountants, and lawyers with strong technical skills and a network in their industry. 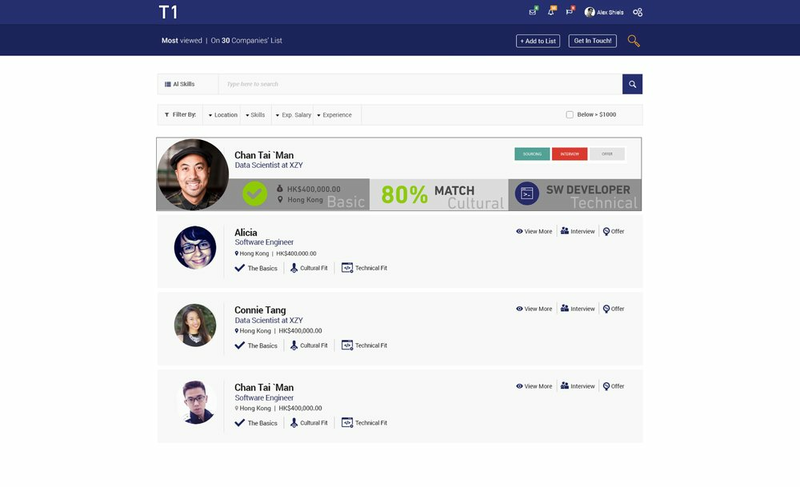 My mission was to design a dashboard for recruiters to be able to search for suitable candidates as well as designing the candidate's profile. They provided me wireframes and an old mockup which I had to translate into highly polished visual mockups for their MVP (Minimum Viable Product). This is the old search page recruiters could use to search for matching candidates. Candidate Search Page - This is my redesign of the search page. Beside the visual part I focused on interaction design to make it easier to set filters and to view quick information. I got this wireframe about how they would like the candidate profile page to be. Candidate Profile Page - I finally deviate from the wireframes because from the UX perspective it works better for the user to always be able to navigate on the profile while scrolling through the details of the selected category.